White Wolf : A 16-year-old Yup'ik Teen Sings Traditional Yup'ik "Blessing Song"
A 16-year-old Yup'ik Teen Sings Traditional Yup'ik "Blessing Song"
“You see a young person making a change and you want to do that too. Like, monkey see monkey do. So if they see me making a change for my community, all the Alaska Natives, they’re going to get inspired. They’re going to start going to dance practices,” he said. A blessing song was requested by a couple of people and I agreed to sing it. (: this is one of the most, if not, the most respected traditional song that I know. 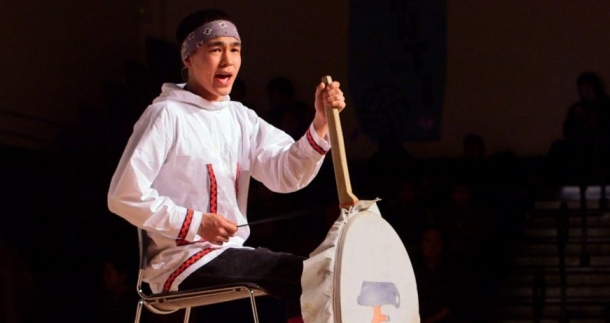 Responses to "A 16-year-old Yup'ik Teen Sings Traditional Yup'ik "Blessing Song" "